I love it and think the little off white pieces near the border are good because other wise it would make for a very large dark area. Just my thoughts. But it is great. I love the new design with the barns, it came out beautifully. The title of this post sums it up. It is lovely Terry :-) congrats on a great job. 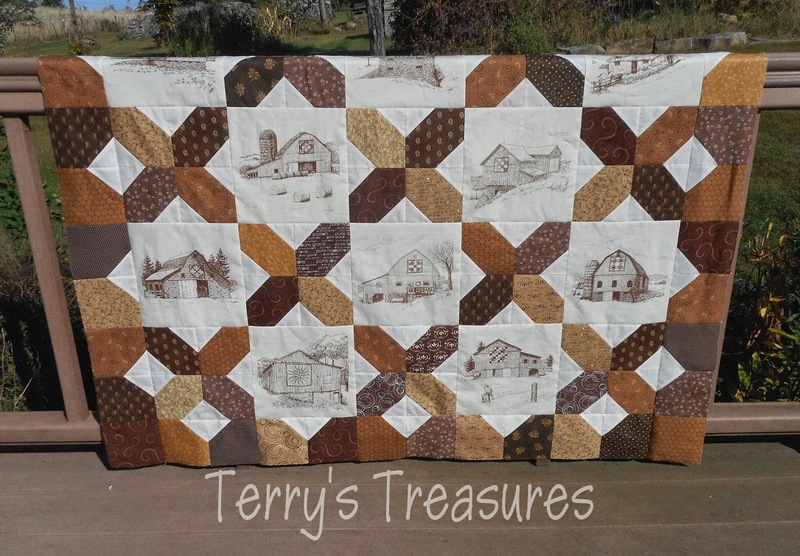 This quilt is aptly named, Beautiful Brown Barns is right! 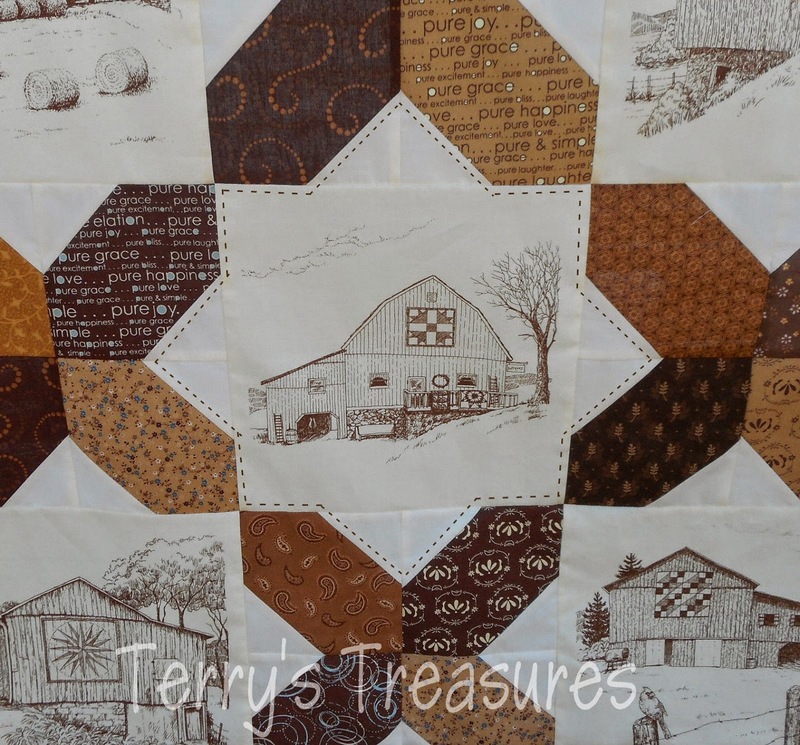 I love the browns in this quilt. I think drawing the lines is a great idea! Glad you had a day to sew. Well done. Great idea on the outline stitching. It is going to be a comforting country quilt. Well done. And the extra white squares near the border do belong there. This is WONDERFUL! I love the setting and the little white squares in the border make it sparkle. Clever idea to add stitching with a pen. G!eat quilt. It looks terrific and I thing the "stitch" lines will finish it off nicely. BEAUTIFUL! Is this the barn panels? 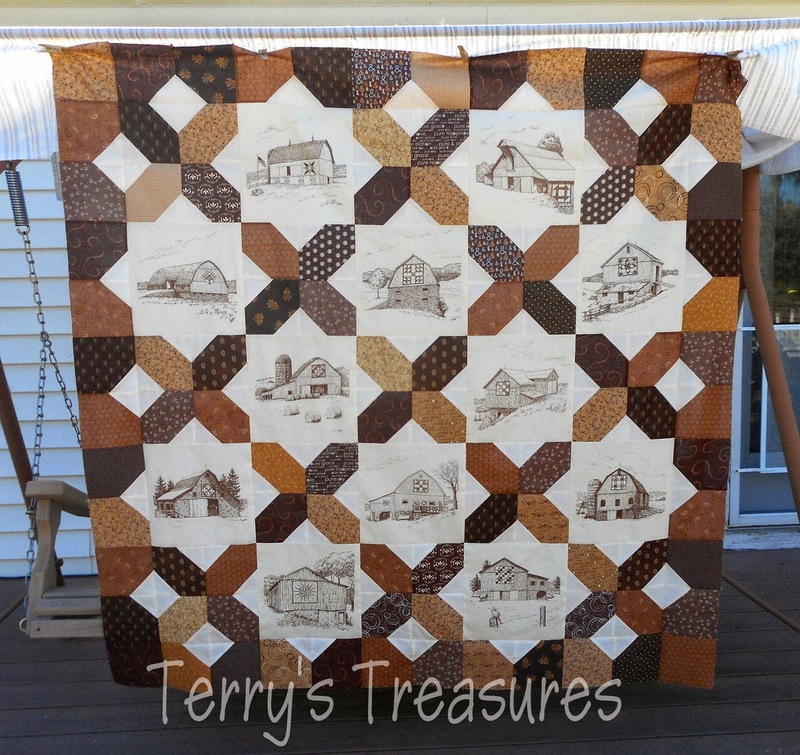 I have the stitching patterns for these barns but I so wish that I would have bought the panels instead. I will never get around to stitching them. You quilt has turned out very beautiful! Looks so, so wonderful. So wonderful as always your work. It's awesome, Terry! You did an amazing job and the faux handstitching is such a great touch. I love it! The 'stitching' lines are fantastic. What a great idea. You did a wonderful job. Good to see that you use your day off to advantage. Glad you found some time to sew:-) It looks great! Oh Terry this is just stunning. Perfect setting for the barns! I like the idea of drawing the stitching lines, I think it's wonderful - and I cannot WAIT to see this one quilted!! !